I'm so pleased to present my interview with Jason McDonald, Founder of The Great Mississippi Tea Company. I've come to know Jason through attending his seminars at World Tea Expo, and he's a brilliant tea farmer and all-around super nice guy. He runs The Great Mississippi Tea Company with his partner, Co-founder Timmy Gipson. They have created a successful tea garden with incredibly innovative practices. Learn all about what they are doing in our interview below. Why did you decide to become a tea farmer? 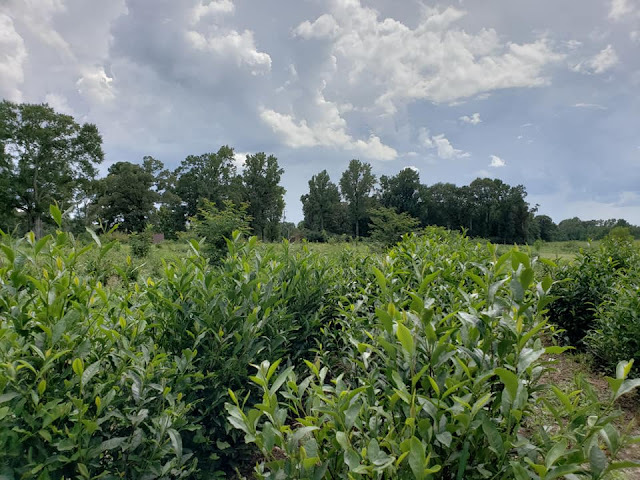 I was on a trip to Savannah and I was presented a tea bag at a restaurant from Charleston Tea Plantation which read, “America’s Only Tea Garden.” That is not true and also was not true when it was handed to us, but we didn’t know any better and it is the reason we went. We had never really thought about where our tea came from. We just assumed it was growing amongst the corn in Iowa or something. When we arrived and they said tea is a camellia that needs high heat, humidity, acidic soil, and ample rainfall, we immediately thought of home. How many years of research and collaboration did it take before you could start growing and processing tea? We visited Charleston may times that year with various family members. Our first trip was in April 2012 and we had ordered plants by October 2012. Nigel Melican made his first visit in Dec 2012. We planted a test plot in 2013 and we had a trial run for tea making in 2015 for The Tea of the United States Awards in Hawaii in Nov 2015. 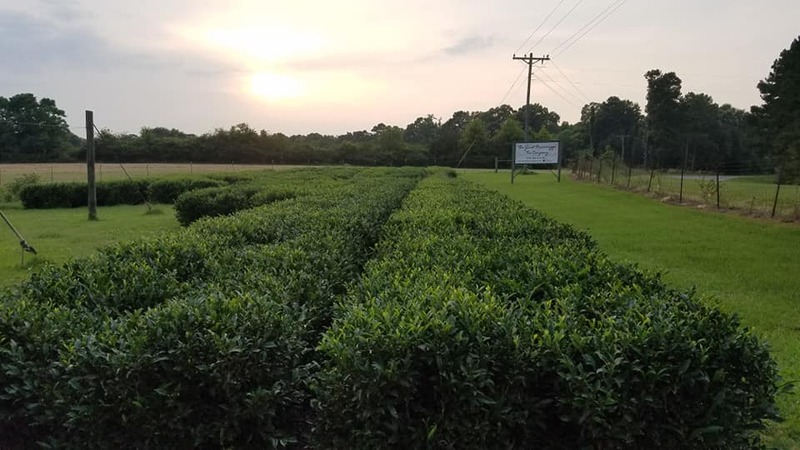 We had a limited tea production year in 2017. It was mainly to create Black Magnolia and MS Queen. Our first limited commercial run was this year—2018. Where did you source your tea plants from? Our original order was from a wholesale nursery in Greensboro, NC. We do not know where they originally got their plants. They seem to be a collection of existing tea plants from the US. There have been numerous attempts over the last 250 years to grow tea commercially in the US. Also, people grew tea plants in their gardens as “curiosity” plants. We also went on two “US Tea Tours” and sourced plants from gardens around the SE US. We had a woman named Penny who also gave us 2 plants from her yard that were planted in the early 80s from stock bought at Charleston Tea Plantation and a Lipton test garden in Poplarville, MS. Since this initial stock run, we have imported seeds from the former Soviet Republic of Georgia and Nepal. Last year, we imported biclonal and elite seeds from Nepal. We are testing a variety of sources to find the ones that grow the best here in our climate. Can you tell us a little bit about the process of farming tea organically, and why you chose to do so? We actually tried organic from the start and it was a disaster. Labor constraints made this virtually impossible on the scale on which we are trying to grow. We are on a path to organic, but at this point, we are not certified organic. We do try to limit synthetics to an absolute minimum. What has been one of the biggest challenges of growing tea? Lack of good information—there are a lot of people who have written books and other publications who are dispensing bad advice. You have no idea how many people visit the farm that have bought a book and said all the information in it is wrong and has cost them dearly both with lives of plants and wastes of money. We knew early on that we would need good, factual advice. So, we hired a consultant. I am also venturing out into the consulting world. Beware of free or cheap (some books) advice! It is just that! Your work with Timmy is so innovative! I remember at a World Tea Expo seminar this year you mentioned you created a pruner from an old lawnmower. Can you tell us a little bit about your innovation on the farm? We have repurposed many everyday household or restaurant equipment pieces to process and grow tea. Since most of what we need is in China or Japan, we tried to understand the process of what the machine does and replicate it here on the farm. We have a rule that we never buy a piece of equipment until we can do it either by hand or with an improvised machine. If you are making specialty tea, you need a few pieces of basic equipment which are a roller and a dryer. So many great teas are made and destroyed by improper drying in the US. Other than those two machines, the possibilities are endless. A word of caution—understand what you are trying to achieve with the machines or the repurposed machines. If you don’t it will be a mess. We have had people try to use a freezer because they have seen us use one. We have had people try to use a bread proofer because they have seen us use one. We have had someone try pine tree tubes for growing tea because they have seen us use one. If you do not understand what we are doing with the machine and why, you will more or less fail. Things can go horribly wrong in a hurry if you try to emulate someone without the knowledge of what they are doing. We have dried tea with a hair dryer and won awards. We have used a toaster/convection oven and won awards. It proves If you understand the process, you can make good tea. On your website you mention the importance of mechanizing the tea operations to reduce labor and creating an ethically sustainable process. Can you elaborate on this a little bit? Let’s face it—a lot of tea production relies on exploitation and use of cheap labor. People are coming around to the idea of paying more for quality tea, but the world market is not there yet. So, the choice has to be made by producers to either innovate or further exploit. I don’t want to debate the finer points of this practice because there is practicality in it. We are endeavoring to pay fair wages and try to return more to the land and the community at large than we take from it. I believe in a higher minimum wage so I pay my workers that minimum wage even though I am not legally bound to do so. There is room in the tea world to do this, but prices have to be met to balance cost of production. That is why we are choosing a fully vertically integrated model of paying fairly, treating the land fairly, and spreading profits fairly among all who participate in the creation of our teas. Because of this, machinery will need to be used. It is the only way to reduce cost of production. We are seeking highly sophisticated machinery to simulate hand plucking and processing. We hope to not reduce quality in the process. More will be revealed. With the changing environment and increase in storm activity, are you concerned about the safety of the tea plants? We are not really worried about our plants and climate change. A study was conducted at Tufts that showed MS becomes more ideal as the climate changes through 2050. This was an independent study that we found out about a year after its publication. What changes can we see for the Tea Company in the next few years? We will continue to grow and branch out into new tea types. We introduced both a black and a green last year. This year, we added an oolong. We may venture into Puehr style teas in the coming years. We will continue to add production so there will be more of the teas to go around. That is our major problem right now—not enough to go around. Just like the handyman’s house needs repairs, we really don’t. However, we love seeing how others enjoy our teas in their daily lives. It is gratifying to know that we are a part of their lives and even taken on vacation with them. Thank you so much for your time, Jason! Jason and Timmy are actually in London this week, showcasing their Mississippi Queen and Black Mangolia teas at the legendary Fortnum & Mason! Fortnum will now be selling the teas in the shop and serving Mississippi Queen in the tea salon. To purchase their tea in the states you can visit The Cultured Cup's website for both the green and black teas. I can't wait to see how Jason and Timmy grow the tea garden in the near future.